Smart Answer. Customer service software. Features and workflow. Customer Service Software. Features & Workflow. Advanced contact formYou may create up to 10 form fields of a text, drop down menu, checkbox or date type. Each custom field supports required, hidden, read-only attributes and allows assigning default values. Copy and paste html code to your site and start processing your customer inquiries in a professional way. No programming knowledge, no software downloads required. Our server will handle it all - validation of submitted data, file uploads, issuing of unique service ticket number and email alerts. 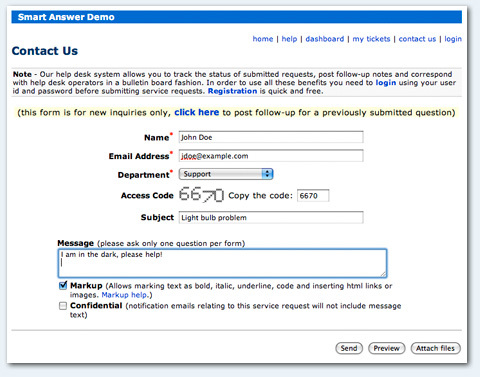 See the sample contact form in action on our help desk demo. 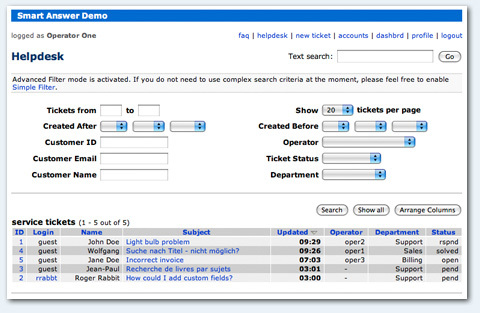 Ticket trackingMultiple operators can access the system 24/7 from anywhere in the world. No lost or forgotten service requests. No guessing who is responsible. Visible tracking status and customer info. 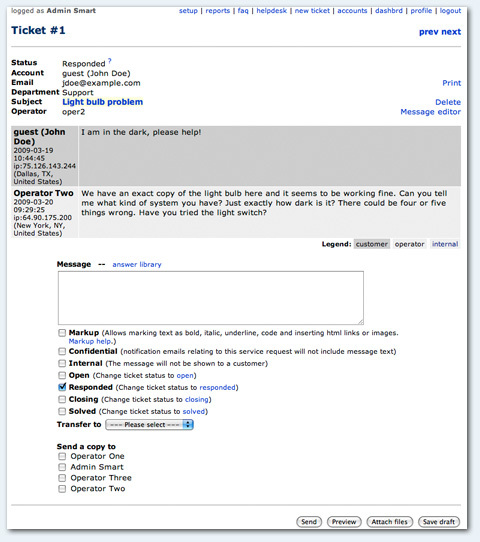 Customizable interface allows choosing what information is visible while browsing tickets. Advanced filtering and search features provide easy navigation. Operator may also post hidden messages to facilitate ticket notes and annotations, transfer ticket to another operator and edit values of custom fields. To learn more about our customer service software please use our help desk demo or setup your own service portal and test it live.